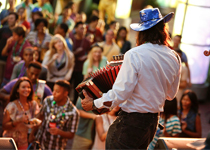 Enjoy an authentic New Orleans celebration with nightly parades, dazzling entertainment including superstar concerts on select nights, and mouthwatering Cajun food available for purchase. Best of all, the festivities are included with your theme park admission, Annual Pass or Seasonal Pass*. It’s unforgettable springtime fun for everyone. *Seasonal Passholders are blocked out of Universal Studios Florida™ the entire day on Mardi Gras concert dates. You can’t have a great party without great music. On select nights of Universal Orlando’s Mardi Gras, catch performances from some of the biggest names in pop, rock, country, R&B and more at the Music Plaza stage. 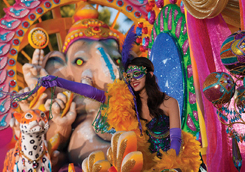 Gather the family to watch street performers, stilt walkers, colorful dancers and phenomenal floats parade through the streets of Universal Studios Florida™. Confetti will fly as countless strands of beads are tossed into the crowd at this wild and wonderful evening event. Little ones will love it and our Little Jester’s parade viewing area, designed just for them. Our French Quarter Courtyard sizzles with authentic New Orleans cuisine and grooves with live music. Kick back with great tunes and tap your toes while you savor Big Easy favorites like Spicy Jambalaya, Grilled Andouille Sausage, Shrimp, Gumbo and more.